with assistance from sundry others. “Thirty Years Of Sweat & Gears” the sweatshirt logo entry that did not make it to the Wheelers’ competition short-list in 2013 but seems to be the best possible title for this brief history of the club in this its 30th year. So, 1983 – less traffic and better road manners back then gave us more pleasant cycling conditions than those we endure today. Up the road I see a white head bobbing slightly and sunlight glinting off pedals, with a bit of effort I pull alongside and for a brief moment we ride side by side. The moment is brief indeed and The Bird’s front wheel edges in front of mine and that’s how it has been ever since. Despite this tendency of his we got together for evening and weekend rides and are still the best of cycling buddies. As I write this the old boy is recovering from some minor medical setbacks but is threatening to resume half wheeling me soon – bring it on! Our early rides centred on local hostelries with stops for a “swift half” and soon the idea of forming a club came up. It was eventually decided to arrange an Invitation Ride and on the great day a motley crew of the halt and the lame of all ages on all manner of two wheeled contraptions assembled in The Market Place for a leisurely trundle round a ten mile lanes circuit with a stop for refreshments at Bratton. From this inauspicious beginning the fledgling Westbury Wheelers was formed. 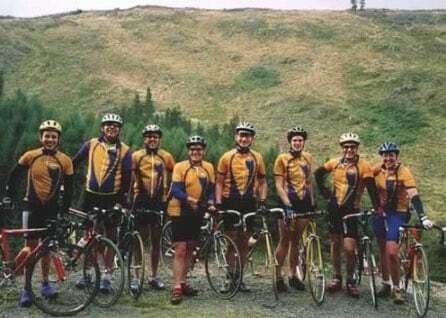 From the beginning the club’s ethos was based on enjoying bike riding and the camaraderie and conviviality of the road. The initial membership covered an age range from eighteen to a very game lady (Mary Wyn Jones) of sixty plus on a roadster complete with shopping basket!! Mary rode with us for several years progressing to an elegant ladies mixte machine and coped well with the more leisurely pace of those early club runs. She even sampled the delights of tow path riding culminating with a plunge, bike and all, into the murky depths. Some of the regular dates on our calendar included The Marrow Environment Charity Ride based on a fifty odd mile circuit starting at Bratton touching the Wyle and Woodford Valleys then over the plain to Tilshead and back for a medal and a tasty barbecue which included juicy giant prawns at Bratton House. We rode then as cycling marshals, stopping to assist anyone in difficulties. 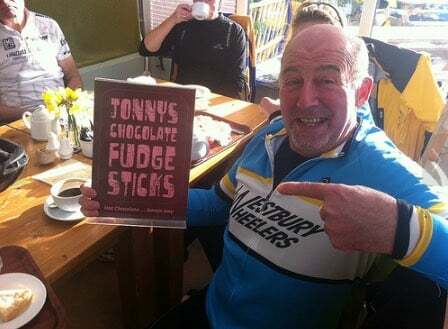 On several occasions the club group started early and did two laps providing some members (stand up Nigel Edgar) with their first “ton up” ride. Once we even started on a third circuit but common sense and the thought of barbecued prawns prevailed and we returned to Bratton so as not to miss out on the goodies on offer. When Wiltshire Council inaugurated The Wiltshire Cycle Way we added this one hundred and sixty mile jaunt to our list of “must dos” and for some this is still the longest single day ride on their palmares. Towards the end of this long day in the saddle the strains of “Ring of Fire” accompanied us as we came along the Bratton Road. This club was the first group to complete the trek in one day. Car Assisted Rides were another favourite with many and enabled us to explore parts of Wales and The West Country normally outside our usual range with The Gospel Pass from Abergavenny being a regular favourite. 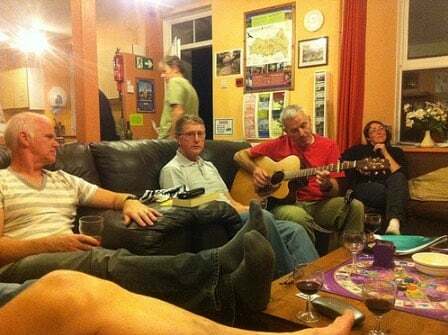 The Hostel Weekend was and still is a firm favourite and has been based for many years on our sole occupation of Llandeussant Hostel giving access to some really hilly terrain for the masochists and sadists in the club. This fixture also provides a good chance to boost Britain’s wine sales with some hilarious evenings around the fire competing in Ted Walcroft’s Cherry Stone Spitting Competition and Pete Warren’s Furry Saddle Evening, you will have to ask Pete about that one it is too long to go into here, suffice to say it ended with the author having to share a single sleeping bag with A. N. Other. Work that one out if you can!!! When all other entertainment fails Mr Warren has, on occasion, serenaded members with his guitar. This has led to some nasty accidents as members bolt upstairs to bed. Our forays have not been limited to our home country, we have from time to time ventured across the channel to La Belle France usually to see Le Tour and get merry on cheap French plonk. One such visit resulted in us completely taking over Le Perroquet Vert (Green Parrot) café in St. Malo for our evening meal with the result that Le Patron retired to Provence on the proceeds. Another claim to fame achieved in France was the introduction of the rule banning groups of cyclists from Formula One Hotels as result of our evening entertainment and the Deux Femmes Aux Douche and a demonstration of a new use for panniers incidents. We are also famed in France for showing posh yachting tourists a view of the English they will long remember! Over the years club membership has had the normal up and down swings and, at the time of writing, stands a very healthy one hundred plus. In the main this is of great benefit to the club and our sport but under present day traffic conditions and subject to the appalling attitude of some motorists towards cyclists we need to be ever vigilant out there on the road. It is particularly pleasing that we now have a healthy proportion of lady and junior members. In conclusion, on a personal note, I have to say thank you to all members past and present who have put up with me over the years and wish you all many more enjoyable hours awheel. Keep Safe!